1. Research a wide range of similar products. Collect plenty of images not only ones you like but also those that do not appeal to you as good designs. 2. Select at least three of the products and use these for the product comparison. It may be wise to choose products that look very different although they must serve the same function. 3. The notes for each product should follow the same format, this usually means the same headings. 4. Keep the notes relatively brief. 6. Present the work clearly and neatly. 7. The headings shown opposite may not apply to the product you are designing. You may need to invent your own headings. 8. You may have to estimate joints used or over dimensions. 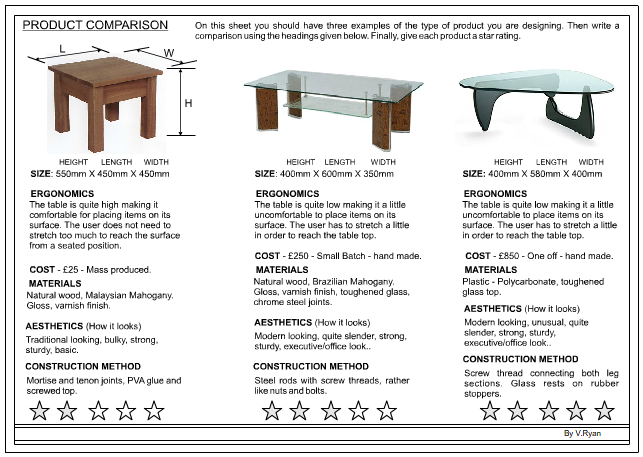 For example, you probably cannot see the type of joint used on the first table shown opposite. However, you may assume that the joint used is a mortise and tenon. 9. If you do cannot find the price of a product, estimate it. 10. The aesthetics section is where you state if you like the appearance of each product. This is your opinion, do not listen to the opinion of others. Make up your own mind. A sample layout is seen below. The three tables are shown at the top of the sheet and the detailed comparison below each one. A. Collect at least ten images of similar products. Then select the three that you feel are the must interesting. B. Glue the selected images at the top of the design sheet and place notes underneath each. Ensure the headings are bold and stand out. C. Keep the notes simple and to the point. 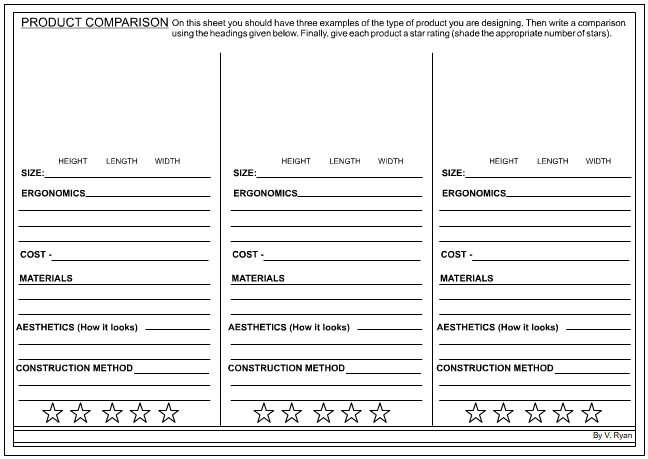 A blank Product Comparison template sheet is shown below. For a printable version click below. A number of examples are also included. 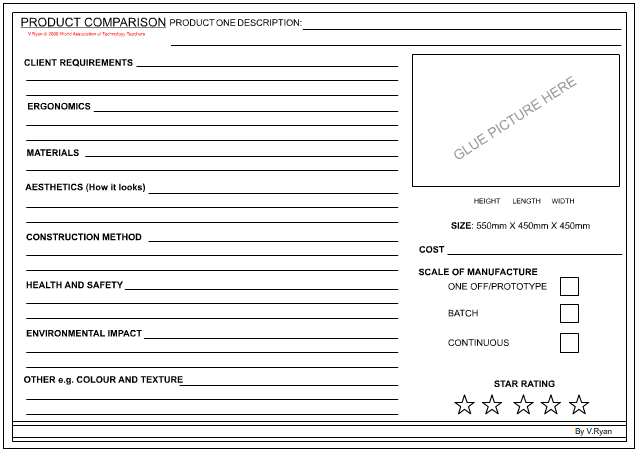 If more detail is required for each product the comparison can be placed on individual sheets. An example layout is seen below.